My colleagues, who are money nerds just like me, know that I’m obsessed with finding the best retirement calculator. I’ve been on this quest for years. As you’ll learn later this week, my favorite retirement tool is (and has been) NewRetirement. But there are other great tools out there. Last week, at long last, I had a chance to chat with Tyson Koska, the founder of OnTrajectory. During a 30-minute call, he walked me through setting up an account and playing with the tool’s features. I’m impressed. NewRetirement is still my favorite tool, but OnTrajectory is damn close. And I can see how for some people, the latter may actually be a better choice. Today, let’s take a look at what makes OnTrajectory one of the best retirement calculators available on the web. The OnTrajectory origin story is similar to that of You Need a Budget. Koska spent decades looking for a tool that would give him a high-level view of his financial future. “I couldn’t find one that I liked,” he says. He didn’t like their assumptions. He didn’t like their interfaces. He didn’t like their limited functionality. Eventually, he took matters into his own hands. He built a complex spreadsheet to explore different variables and what-if scenarios. From there, he began coding Excel macros and small software tools. Over time, the current version of OnTrajectory evolved from his experimentation. Just as YNAB grew out of Jesse Mecham’s desire to build himself the perfect budgeting tool, OnTrajectory is a product of Koska’s quest for the perfect retirement calculator. Over the years, it’s morphed from a simple spreadsheet to a complex tool with a distinctive look and feel. “That graph really dominates your tool,” I told Koska on our call. Because Koska considers himself a part of the growing FIRE community — the group of folks who is interested in financial independence and early retirement — OnTrajectory is built with their needs in mind. You want to retire by 40? Fine. OnTrajectory can handle that. You want some absurd saving rate like 90%? No problem. You can model pretty much any scenario you can imagine. A quick-start wizard that asks only three questions before launching you into the tool. A more comprehensive “guided entry” process during which you manually enter your income, expenses, and existing investment accounts. Designate expected income, including regular salary, Social Security, pensions, rental income, and so on. Specify large, recurring expenses such as vehicle payments, housing payment, insurance premiums, property taxes, and the like. You can add to or alter these numbers at any time. They’re not set in stone, so don’t be afraid of making mistakes. OnTrajectory is free to use for fourteen days. (You don’t even need to enter credit card info, which is awesome!) If you’d like to continue using the tool, however, you have to subscribe at $4.99/month (or $49/year). OnTrajectory seems simple at first, but the more I worked with it, the more I appreciated how it handles complexity. One of its strengths, for instance, is the ability to plot a variety of possible futures. Our lives are dominated by uncertainty. Sure, there are likely paths that lie before each one of us, but there’s plenty we don’t know. Plus, a few times each decade, we reach major forks in the road to our future. Do I take this job or that job? Do I move to Savannah, Georgia or do I remain in Portland, Oregon? Should I draw Social Security at age 62 or wait until I can get maximum benefits at age 70? Normally, it’s tough to predict how your decisions will affect your financial future. With OnTrajectory, however, it’s simple to explore these “alternate dimensions”. You can toggle any parameter at any time. Here, for instance, is a list of my potential income sources. I’ve included working at the family box factory, two possible income levels from this website, eventual Social Security payments, and a potential inheritance from my mother. In Personal Capital, it’s nice that you can add or remove various events to see how doing so affects your future. But if you remove an event, it’s gone. You can’t save it. With OnTrajectory, you just toggle a button to see the difference. If you want to add, say, an inheritance back into the equation, you just click the button once more. What this means from a practical perspective is that you can enter several possible scenarios/events that you deem likely, then explore different possible futures. This is a very handy feature. You can also play with tax rates, investment contributions, investment returns, and more. 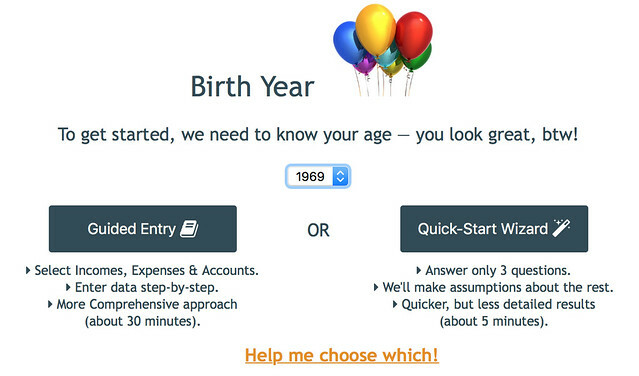 As you might have noticed, you can enter start ages and end ages for most line items. If you want to explore different possible paths, you can enter additional age range possibilities without deleting your original item. Then you just toggle between the two lines to see the effects of, say, working longer. 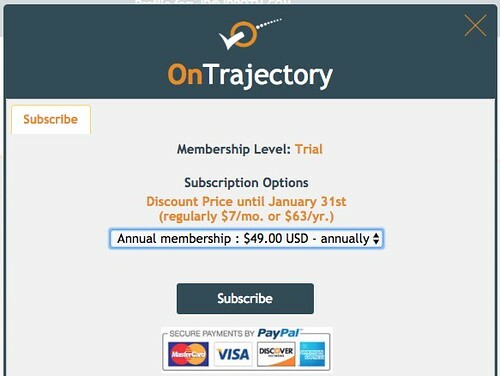 OnTrajectory allows you to set specific goals, such as “I want my Trajectory to reach $1,500,000”. These goals then get plotted on your Trajectory graph. For instance, if I want to know when my net worth Trajectory will hit $1,500,000, the app will plot it on the ever-present graph. In this particular case, it says I should hit that goal on 11 November 2029. So, as you can see, OnTrajectory is very similar to a lot of other retirement calculators out there except that it takes things to the next level. Anything the Personal Capital retirement tool can do, OnTrajectory can do better. But wait! That’s not all! OnTrajectory also allows users to create and print a variety of PDF reports. It includes a handy inflation calculator. And there’s a nascent OnTrajectory community on Reddit where you can ask questions and share ideas. Having said all of that, OnTrajectory isn’t perfect. As much as I love OnTrajectory, there’s one key piece of the tool that I hate: the terminology. For me, it’s confusing. In this tool’s parlance, your Trajectory is your projected future financial path. And your Trajectory for any given date is your net worth on that date. That makes total sense, right? But individual accounts can have trajectories too. If my 401(k) has a Trajectory of $246,136 today, that’s its balance today. So, maybe Trajectory actually means balance? I don’t know. I’m confused. Things get more confusing after you’ve been using the tool for a while. Your Trajectory is based on your initial parameters, not your current situation. The tool does plot a trajectory projection based on your current situation, but your Trajectory (with a capital T) is based on your starting assumptions. I understand that OnTrajectory uses the term “trajectory” to stay on-brand, but for somebody like me it creates more confusion than clarity. I’d prefer that existing standard definitions were used. If your Trajectory is your net worth, then call it your net worth. If Trajectory simply means “balance”, then use the word balance. OnTrajectory is a fine name for the tool, but I don’t see the need to cloud the issue by getting cute with naming conventions. That’s my main beef with OnTrajectory, but it has other minor quirks too. While attempting to enter my Basic Expenses line item, OnTrajectory refused to let me set its End Age to 79 (my projected end of life); it only let me set it to 78. (I was able to set everything else to 79 but not my Basic Expenses. Weird.) 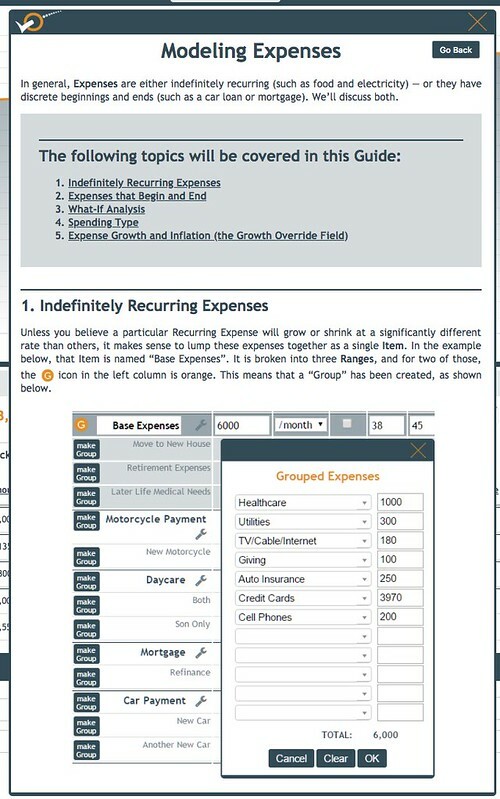 As a result, OnTrajectory believes I have $0 expenses during the last year of my life haha. At one point, the OnTrajectory graph simply disappeared. I changed my projected date of death (or “Trajectory End Age” in the program’s terms) and the graph vanished. I couldn’t get it to come back. After trying a bunch of different things, I clicked the Undo button. I’m not sure what action I undid, but pressing the button brought back the graph. To me, these “minor quirks” don’t affect my overall impression of OnTrajectory. They’re bugs (or features I don’t like). They’re likely to go away in the future. The terminology thing drives me nuts, but I suspect I might be the only person who is bothered by it. And it’s not enough to dampen my enthusiasm for this tool. So far, OnTrajectory is the best traditional retirement calculator I’ve found. (As I said, I like NewRetirement better, but it takes a different approach.) It’s a comprehensive, complex tool — but the interface is never overwhelming. If the interface does become overwhelming or confusing, OnTrajectory features extensive (and useful) documentation. In nearly every section of the screen, you can click on a little info button to bring up the on-line manual. This guide provides answers and tips on all of the functions and features. Impressive. For me, the killer feature is that OnTrajectory not only allows you to save your data, but also to create and save multiple scenarios. You don’t have to re-enter your data each time you want to check on your progress. And if you want to play with possibilities — what if I were to quit my job and take a more meaningful non-profit position? — it’s super simple to do so…without trashing your existing info! The bottom line? OnTrajectory is like the Personal Capital retirement calculator on steroids. It has everything I like about the PC tool, but is much more customizable. In fact, I like it so much that I signed up for a paid account!